Glenn Robinson III is the NBA’s new dunk king, with an assist to Indiana team-mate Paul George, the Pacers’ mascot and a Pacers cheerleader. Robinson leaped over all three, snagging the ball from George along the way before finishing with an emphatic, two-hand, reverse jam, giving him a perfect score — and the title — on his final dunk. “I know I’m a jumper. Like I said, I’m a guy that stays out of the way, but when it’s time to shine, that’s my thing,” Robinson said. “I knew all along I had some things planned and I just wanted to show the world.” Robinson edged out Phoenix’s Derrick Jones Jr, who was done in by his failure to complete his difficult first dunk of two in the final round. Jones still managed a perfect score on his second dunk, when he received a bounce-pass in the paint, put it between his legs and threw down a left-handed jam. But Robinson made sure it wasn’t enough. Both dunk finalists delighted the crowd with soaring slams over team-mates and others that showcased the explosive spring in their vertical leaps. “I thought I would go up against Derrick in the finals,” Robinson said. Jones jumped over four team-mates including Devin Booker and Marquese Chriss in the first round. He also drew roars from the crowd when he took a pass off the side of the backboard from Booker with his right hand, put the ball between his legs to his left for a round-house jam. The dunk that cost him was a bold one. He tried to leap a friend and the Suns’ gorilla mascot, grab the ball on the way over, put it between his legs and then finish with a windmill. But he couldn’t get the dunk to go down in his allotted three attempts.DeAndre Jordan of the Los Angeles Clippers and Aaron Gordon of Orlando were unable to emerge from the first round. Jordan dunked over DJ turn tables and Gordon dunked after receiving a bounce pass from a drone that had flown over the court with the Star Wars theme music playing. 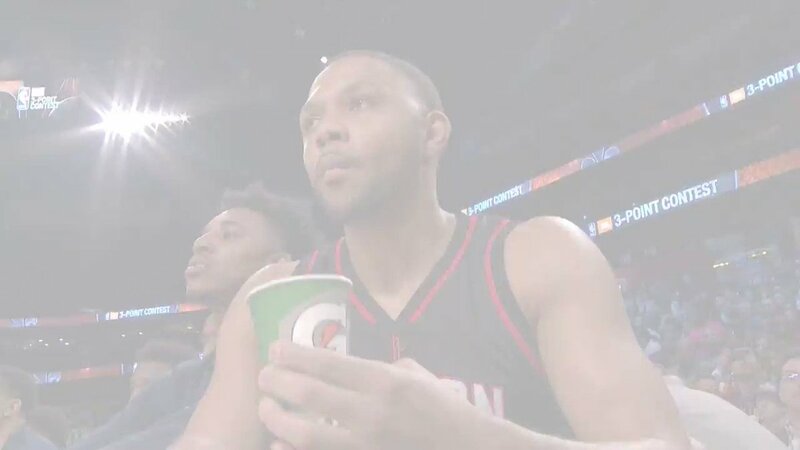 In the three-point contest, Houston’s Eric Gordon dethroned Golden State splash brotherKlay Thompson.KristapsPorzingis of the New YorkKnicks won the skills challenge.